Methinks we need a salad to start off 2010, what do you say? I, for one, consumed all too many calories over the last month and I am hereby committing to eat a salad today to make up for it! I’m, like, so dedicated to healthy living. This salad, whether or not it fits your definition of health food, is amazing. Absolutely amazing. 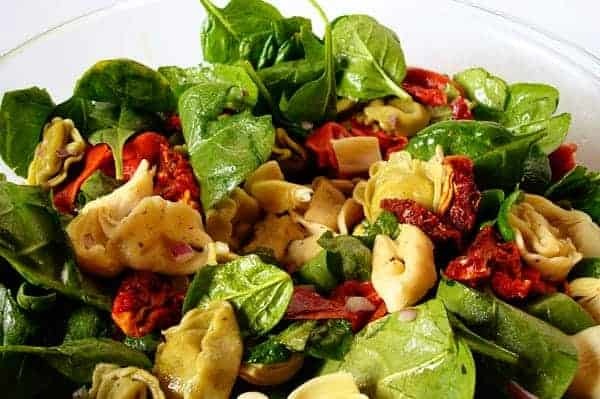 Delicious baby spinach leaves make up the base of the salad and cheese-filled, tender tortellini are intermixed, giving a wonderful depth and weight to an otherwise leafy salad. Add in the-one-and-only artichoke, tangy sundried tomatoes, spicy red onions, and creamy feta cheese and you have a salad masterpiece. Toss it all with a unique balsamic-tomato vinaigrette and I could eat this every night of the week and still be satisfied. Perfect for entertaining or for a light weeknight meal (especially with the addition of grilled chicken), this salad has escalated to the highest ranks of my go-to salads. Thanks Debbie L. for the recipe! Cook tortellini in boiling water until al dente. Drain and toss (carefully so the tortellini don’t break apart) with a teaspoon of olive oil to keep from sticking. Let cool in colander. In a large bowl, toss all the salad ingredients together after the pasta has cooled. Recipe Source: adapted from Debbie L.
This was fabulous. I followed the recipe exactly, except I also added some chopped fresh tomatoes too. This made a huge bowl of deliciousness and we kept some of the dressing aside (it does make a lot) since we will have the leftovers for lunch and didn’t want the tortellini to get too soggy. THANKS so much for this – will will make it again and yes, it would be awesome to serve at a BBQ or family get together as a substantial side. I made it after my daughter’s baby blessing for my family a few months ago and just made it last week when we had some friends over for a light dinner with rolls. Love it! No changes needed. Hearty enough to pass for a dinner, or a substantial side salad. So yummy. We love this recipe! I’ve made it with all kinds of tortellini – Costco has lots of different kinds & all of them have been great! Tonight it was w little pumpkin purses. Very yummy, healthy & easy dinner, my favorite kind! Megan – hope it worked out for you! 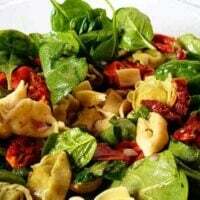 I knew when I read this recipe that I would love it, but I had my doubts that my husband would because it calls for artichokes, sun dried tomatoes, raw onions, and spinach. I made it anyway, and my husband couldn’t stop raving about. I added grilled chicken chunks and the whole dish was divine. One serving is more than satisfying, but of course, it tasted so good I had to have seconds! Meredith – I think grilled chicken in this salad would be divine. Glad it was a hit with both you and your husband! This was such a delicious salad. I added some thin grilled chicken with lemon pepper seasoning to make it a complete meal, but I could easily see serving it for a large group without. The dressing was fabulous and so easy and flavorful. LOVED IT! Juliann – I bet this salad was delicious with grilled chicken! Can’t wait to try it that way and make it a complete meal. Why on earth would we need salad, lol! I’m very proud of you for making this the first recipe of the year, though – it looks delicious! I have the tortellini but will have to hold off making it until Himself ploughs the dirveway then a cautious drive into town to get the rest of the ingredients – lots of snow in SW Michigan. Happy New Year! That is one amazing looking salad! It’s got quite a few of my favorite ingredients (feta, spinach, sundried tomatoes, artichokes). Happy New Year! Me, too. I ate too much and probably gained 10 lbs over the break! Yikes! This salad looks great! well, i already know you have a winner here simply by seeing sun-dried tomatoes in the list of ingredients. yum. the dressing sounds pretty spectacular too. great salad, melanie! looks delicious! would the salad taste the same if i used arugula instead? I just love it when I find a recipe that has every ingredient in my fridge! I made tortellini a few days ago, and have some leftover. I cannot wait to make this one! I’ll let you know how it turns out, but I can tell that it’s amazing! This one sounds perfect to me! I can’t wait to try it! After a few weeks of eating all the wrong things, this salad looks perfect! Thanks for sharing. bring on the salad baby, i need it after the two weeks and sinful gorging! this is beautiful! That salad looks wonderful and a good way to get back into eating more veggies! Keri – arugula makes a good substitution for spinach if you like the mildly spicy flavor of the arugula. I think it would be great in this. this looks so good! I think I’m going to try it!